No trip to Kenya would be complete without a visit to the Masai Mara National Reserve. This iconic game reserve is Kenya’s biggest draw card, instantly recognisable from films and nature documentaries. It is known mainly for its exceptional population of big cats, game, and the annual Great Migration of around one and a half million zebras, gazelles, and wildebeests from the Serengeti every year between July to October. The wildlife of the Masai Mara is extensive but can be divided into mammals, birds and reptiles. Many of the mammals can be divided into carnivores, primates and ungulates (hooved animals). Carnivores that you are likely to see include cheetahs, genets, hyenas, jackals, leopards, lions, mongooses and wild dogs. Primates include baboons, bushbabies and monkeys. The so-called ‘Big Five’ of buffalos, elephants, leopards, lions and rhinos are, of course, all present. Along with the animals the Masai Mara is also home to the Maasai people, whose pastoral lifestyle and colourful garb and culture has made them Kenya’s best known tribe. There is a variety of accommodation on offer in the Masai Mara, and most take the form of luxury safari lodges. While you are there take an early morning trip in a hot air balloon and sip champagne on the open plains as Africa’s wildlife begins to stir – this is truly an unforgettable experience. 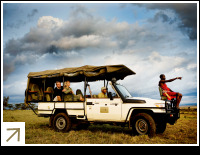 Below are some of our tours which feature a stay in the Masai Mara. If you plan to travel independently you can also contact us and we can help you to arrange transfers, accommodation and excursions.